Officially known as the Republic of Rwanda, this small country in the Great Lakes region of East Africa regained independence in 1962. It is one of only two countries – the other being Uganda – where mountain gorillas can be visited safely. From 1922-1962 it was known as Ruanda Urundi. With independence came the return of Rwanda and Burundi. 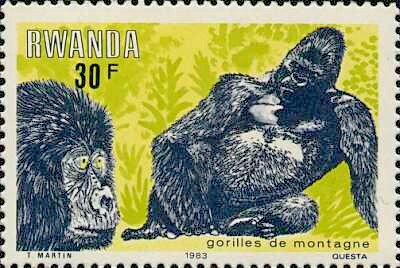 ...I have always been fascinated by zebras and viewing mountain gorillas safely sounds like a good plan. yes, the third country - Congo - is disqualified from the safe category. 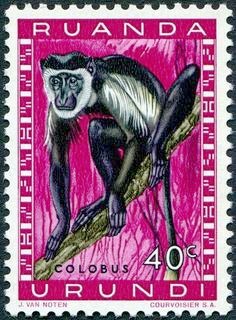 I will have to look closer at colombus monkey's hands if they appear on a wildlife programme. Zebra's are my favourite too and they always look spectacular in a group. Nice stamp. and I thought all monkeys had this common with human characteristic. Very nice stamps for another R. I'm surprised there were so many entires for Q compared with some of the letters - and if I hadn't written it before, I am really enjoying the A-Z. The Q entries surprised me, too! Perhaps we should continue with this A-Z for a second round? 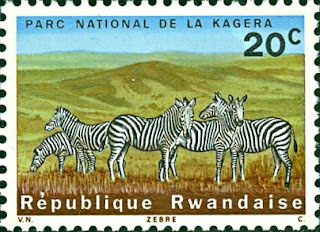 I love that zebra stamp, nice colours! they do stand out, don't they? Great stamps, especially the zebras. I am surprised how many different was have turned up during this A-Z; definitely worth another round.